Henkel has six runnerup finishes, including a 2000 second in Belgium with Sinjin Smith. 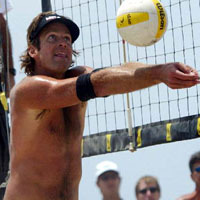 Henkel and Smith finished fifth at the 1996 Atlanta Olympic Games where Henkel was No. 1 in sideout efficiency (87%) and second in blocks per game (4.5). He has competed in more International events (107) than any other U.S. player. Personal: He graduated from Manhattan Beach�s Mira Costa High School in 1987 and UCLA in 1991. He has attended the Whittier Law School and earned his Master�s of Law at the University of San Diego. Henkel has passed the California Bar Exam. He enjoys skiing, sailing and reading.